As a savvy entrepreneur, you understand that your business doesn’t operate in a bubble. There are many outside factors that can determine whether or not your business will turn a profit – and one of the biggest factors is your competition in the market. What’s more, you’re not just competing with a few local businesses anymore. Thanks to the Internet, your competition has increased tenfold. That’s why it’s critical that you take measures to always remain one step ahead of them. But, as I’m sure you’re aware, that’s not as easy as it sounds. Positioning yourself as unique compared to your competitors is only part of the solution. An equally important part is monitoring their growth and hacking their strategies. As daunting a task that may seem, there are a many online tools that can help you do just that. Here’s my list of the top ten tools that can help you keep tabs on your competition. Any list of online monitoring tools is incomplete without the Google Alerts tool, primarily because it’s one of the easiest tools to use. All you have to do is sign into your Google account, and you’re good to go. Simply enter the names of the competitors you want to track, and the tool takes care of the rest. Depending on what you want to track, you can set up the tool to monitor their online mentions, links, and keywords. Every time one of your competitors gets a mention, you will receive an email report with the latest relevant information. The fact that it’s a free tool makes it even more enticing. Just search for keywords or brands on it and the tool will show you what people are saying about them. It also informs you about how often a brand earns a mention. You can tweak your own efforts depending on the insights you gain from the tool. For instance, if a rival has a lot of negative comments, you can learn from their mistakes and avoid them yourself. Similarly, in the case of positive comments, you can emulate if not improve their tactics. You’re probably wondering what Google Keyword Planner is doing on this list. After all, everyone uses it for their keyword research. But not everyone is aware of how to leverage it for competitor analysis. There’s a lot of insightful data you can find on your competitors if you know how to use the tool well. One place to start is by plugging in their URL in the landing page field. This way you can retrieve the keywords they’re using and the average traffic they’re earning. You can also research their ad campaigns to look for long-tail keywords that you can leverage yourself. Note: Google AdWords is now Google Ads. Just input your competitors’ websites and the tool gives you a group of keywords and their rankings. You can even decide which search engine you want to track these keywords on. The biggest perk of Pro Rank Tracker, though, is that you can localize your search and optimize your local SEO strategy. This is why it’s a particularly useful tool for a local businesses to use in their competitive analysis. Many people are familiar with Alexa and its ability to rank websites and display their traffic related data, but very few people realize that it has competitor analysis functionalities too. Most competitor research tools work on the pretext that you know who you’re competing against. They require you to input brand names, domains and keywords, after all. But what if you don’t know who you’re competing against? Alexa can help you identify them. Not only can you track other websites in real time, but you can also compare your site to industry benchmarks. Additionally, you can leverage it to discover sites that would be a good fit for you to partner with or write a guest post for. SimilarWeb is another very handy tool to have in your toolkit when conducting competitor research. It helps you keep an eye on your competitors’ online strategies and analytics. The versatile tool helps you dig into different sites, apps and platforms. Just type in the website or mobile app and click “search.” Compare statistics from multiple competitors, identify emerging industry trends, and understand customer behavior. SimilarWeb mines raw data, processes and organizes it, and then produces the reports that you need. One of the most difficult parts of competitive analysis is converting data into actionable insights. But with an all-in-one tool like SEMrush, competitive analysis is a piece of cake. It covers various digital marketing aspects like PPC, SEO, content, and more. All you need to do is input the website you want to research and the tool gives you a graphic report with relevant data, including traffic, rank, ads and keywords. You can also compare different sites, including your own, side-by-side to see where you’re leading or lagging behind. 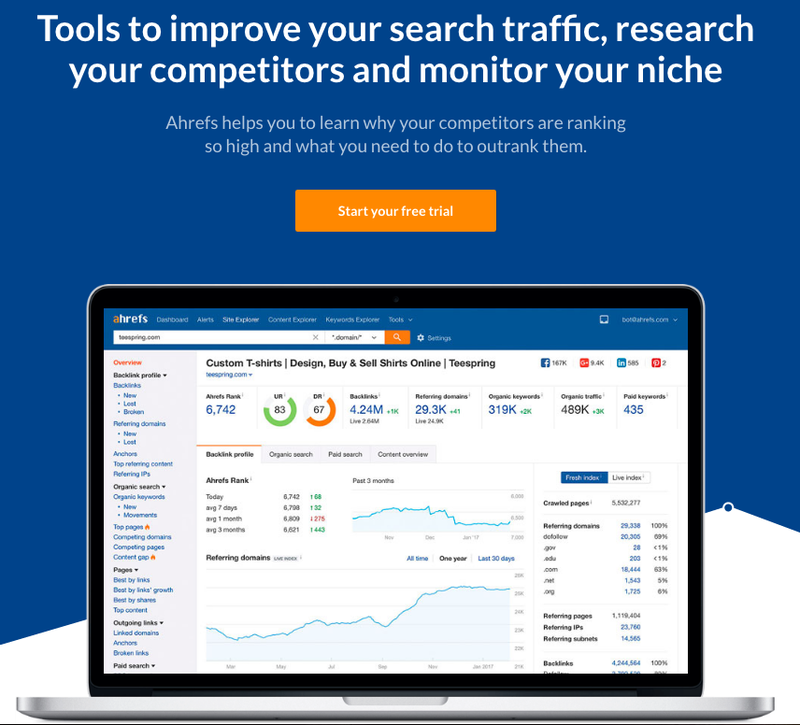 Ahrefs is another noteworthy member of this list because, much like SEMrush, it can help you with all aspects of competitive analysis. It’s strength, however, lies in analyzing link targets and backlinks. You can use Ahrefs to find the domain authority and both old and new referring domains of your competition. This information is vital to help you find out how many links they’re earning each day compared to you. It will help you understand how deep you are in the water, and what you need to do about it. You can even use it to monitor their organic keywords, traffic and best-performing content. So long as you study the comprehensive reports generated by Ahrefs, you’ll have a competitive edge. Woorank is an SEO audit tool that’s perfect to help you understand the on- and off-page SEO of a site. The web-based tool will help you audit both your own and your competitors’ websites. Use it to check which keywords your competition is targeting, their bounce rate, users, page views, and session durations. The tool also gives you week-to-to week reports so that you can track how your site is fairing against your competitors. As is apparent from the tool’s name, SpyFu is designed to help you spy on your competitors. When you type in your competitor’s domain, the tool reports on the keywords that they’ve bought on Google Adwords in the past. You also have access to their organic search rankings and the variations of their ads. Information like how many clicks they earned, or how much they pay for each key phrase can prove very valuable. Such information is a gold mine that will help you with your PPC campaigns. You can also compare your performance against theirs and see how you stack up against them. As mentioned earlier, your competition is one of the biggest factors that influences your business. If you want to stay ahead of them, you need to know what they’re up to. Now it’s up to you to figure out which of these tools can help you monitor your competitors. Building and improving your marketing efforts accordingly will help your business grow.